March 13, 2014 was the anniversary of Chris Hadfield becoming the first Canadian Commander of the International Space Station, and the day Cambie Secondary School in Richmond became the first school in Metro Vancouver to make contact with the International Space Station via amateur radio. 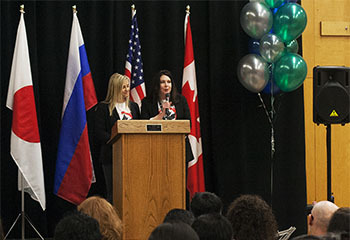 The Flag Shop is proud to have provided free flag rentals for the Canada, USA, Russia, and Japan flags displayed on the stage backdrop for this momentous event. You are currently browsing the The Flag Shop Blog blog archives for May, 2014.